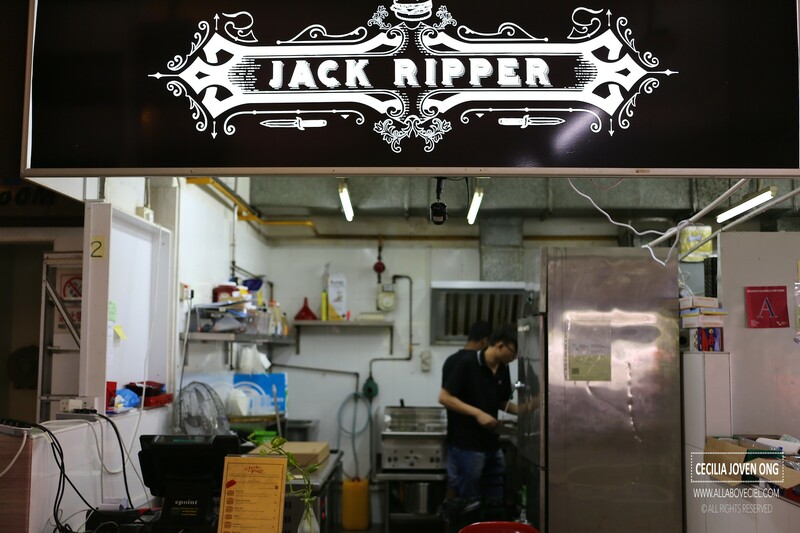 The owner named this burger stall after one of the most known serial killers. This stall is located at the atas Salute Kopitiam together with Two Wings and Immanuel French Kitchen. 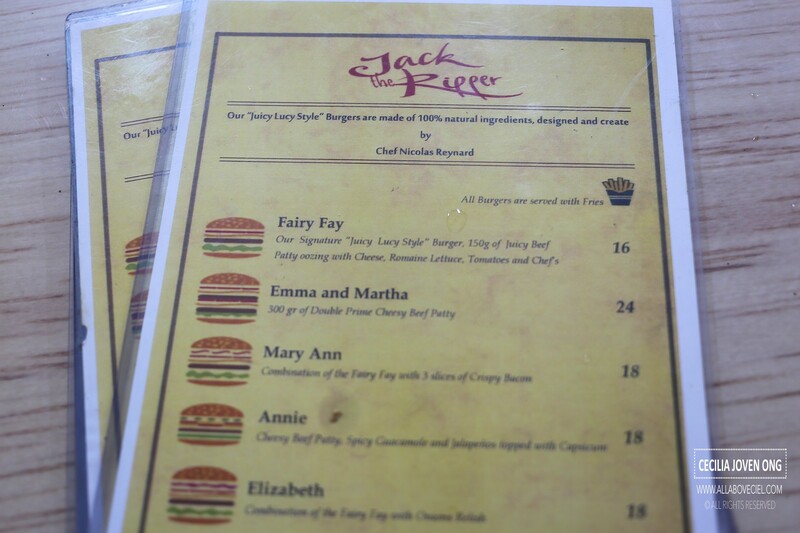 Their burgers listed on the menu are quite pricey : Fairy Fay ($16), Emma and Martha ($24), Mary Ann ($18), Annie ($18), Elizabeth ($18), Mary Jane ($12) and Catherine ($14). And, 5 of these burgers are named after the 5 victims of Jack the Ripper. 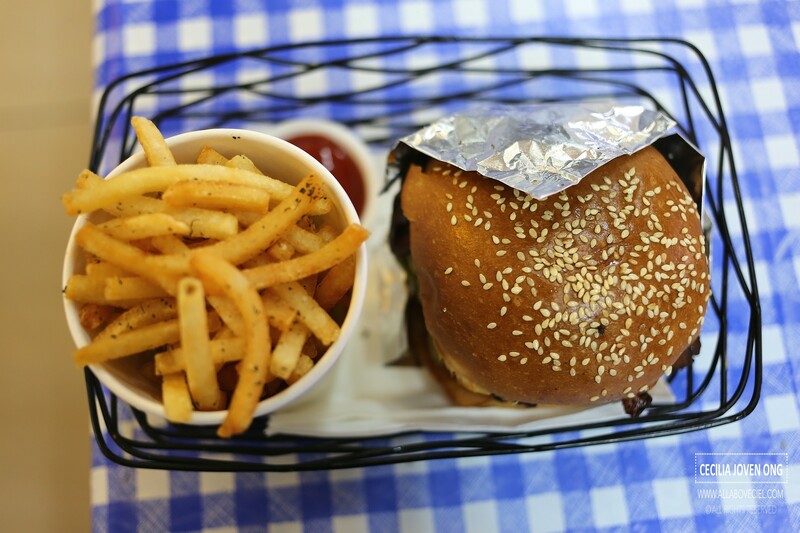 This burger stall is a collaboration between Chef Nicolas Reynard and the son of the Koptitiam's owner. 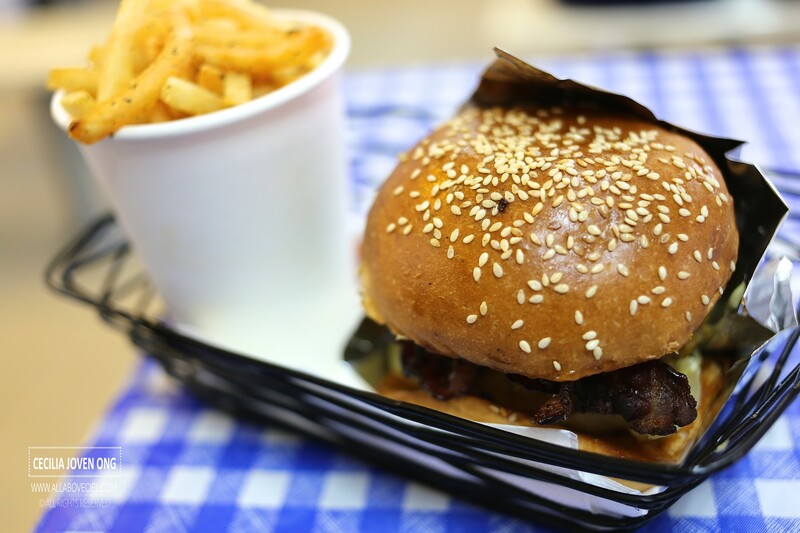 On the menu, it stated, "Our 'Juicy Lucy Style' Burgers are made of 100% natural ingredients, designed and create by Chef Nicolas Reynard'. For this, i was expecting these burger to be of certain standard. I decided to go with Mary Ann since i am such a big fan of bacon. It took quite a while before my buzzer buzzed, at least a good 15 minutes wait even though i was the only customer at that time. The 2 cooks did not seem to be too experienced, in fact, they seemed to be a little clumsy when assembling the burger. 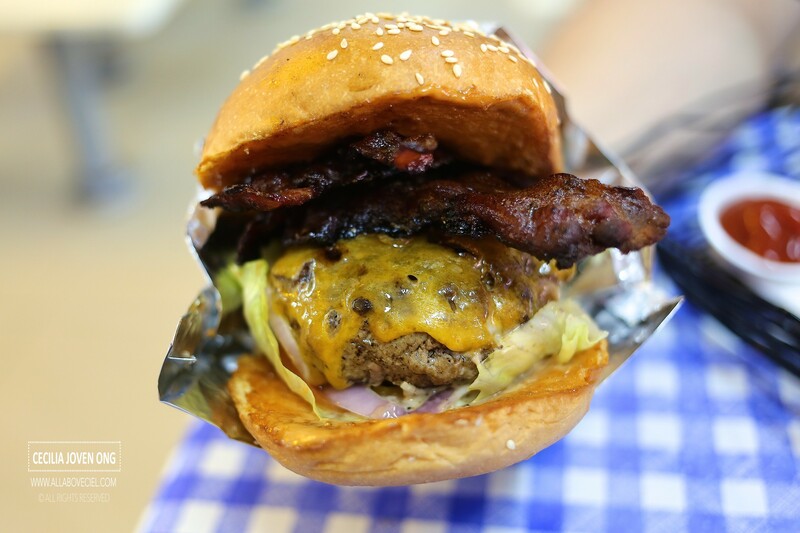 This burger, as described on the menu, it is actually similar with their signature Fairy Fay, it consists of a 150 grams juicy beef patty with cheese, romaine lettuce, tomatos but with an additional of 3 slices of crispy bacon. And, all the burgers on their menu come with fries. First impression was the burger buns seemed to be a bit over toasted as the color was a bit too dark. 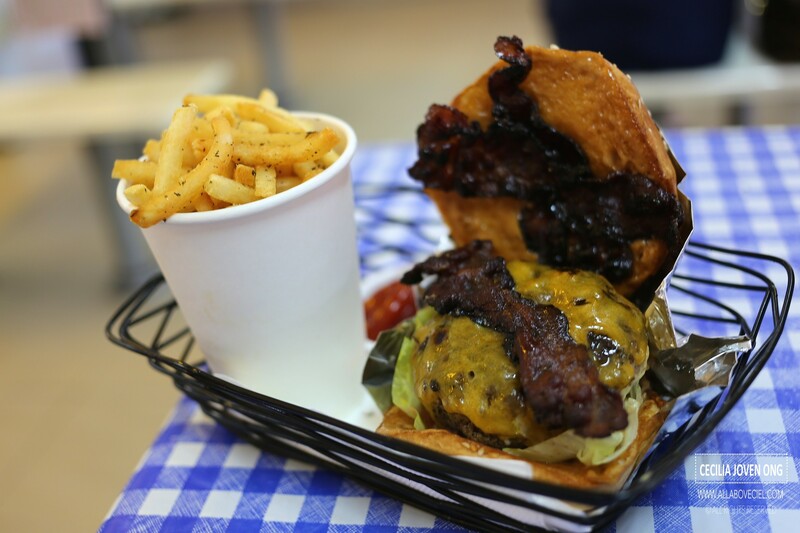 When inspecting the burger, the 3 slices of bacon were overcooked as the color gave it away. The texture was not crispy but hard with a distinct burnt taste that led to bitterness detected. The cheese was supposed to be oozing out as described on their menu but in fact, it was dry and sticked on to the beef patty. The beef patty was not too firm and tasted quite bland as well. Those fries were just normal. This is one of the worst burgers that i have ever eaten, crazily bad. I wonder why did they even bother to serve this burger? The 2 foreign cooks were likely to be just employees thus they did not seem to be bothered in presenting such a burger. I remember that i came across an advertisement placed by the owner of this burger stall for foreign cooks and they will provide accommodation and meals when hired. As a trained HR professional, i am aware of the issue in hiring incompetent employees and worst, send them to do their job without given the proper training. This is likely to be the case here. No pride. LATEST UPDATE: The owner responded to this post by sending me an email. He mentioned that they took notice of my comment and even invited me for a food tasting which i declined. Thank you. That's also my reason for not wanting to do invited reviews.